There is a great sense of well being in knowing that the roof over your head is in good condition. A professionally restored roof also beautifies your home, and the cream on the cake is the knowledge that a roof in good condition also adds to the value of your property. All of this is achieved with Ellemex. Ellemex is exclusive to Roof Seal®, providing top quality protection for your Cement tiled roof, in a manner that eclipses all other preparations currently available. The basis for Ellemex’s strength and success lies in the unique formula. Developed after literally thousands of hours of research and evaluation and test applications. Ellemex has it’s own ‘secret formula’. Our Chemists discovered that by varying the cationic charge of surfactants in the mixture, a powerful bonding property was established. In simple terms the result of this continual experimentation is a coating that exceeds all others in terms of strength, durability, flexibility and colour fastness. 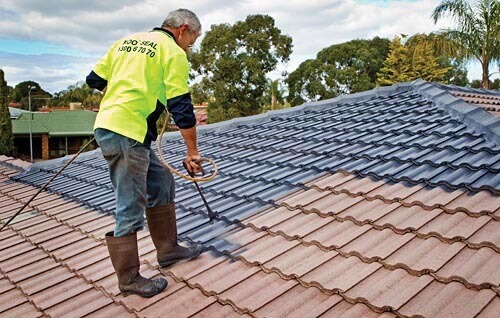 Roof Seal’s tradesmen are carefully trained in the application of Ellemex. Airless guns are used to ensure uniformity of coating and regular technical and technique updates are provided to our tradesmen. A major part of the successful formula for Ellemex is it’s resistance to UV light. This increases the protective properties of the coating and adds considerably to the life of the coating. It’s great strength comes from the fact that it will not become fragile or brittle with continued exposure to UV radiation. Another important advantage you get with Ellemex is it’s ‘rainwater safe’ ability. 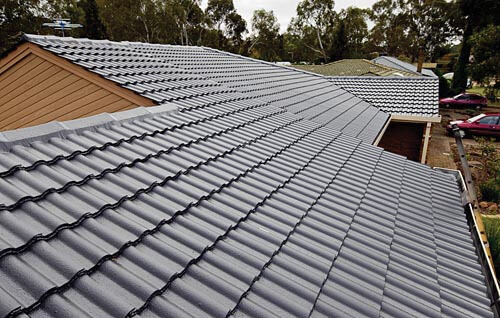 It adds nothing to the rainwater being collected by your roof, ensuring your rainwater supply is healthy and additive free from your roof coating. Thicker application means a high quality, strong finish. In preparing the formula for Ellemex, a primary consideration was the need for a finish that was not just functional but one that was attractive as well. The difficulty was in developing a formula that provided both. the extensive research paid off with a coating that is thick and strong and very attractive to the eye. The clean finish and range of colours that are available can dramatically transform the look of your home. Ellemex is the leading coating available on the market today, no other product comes close to it. To ensure your complete satisfaction and peace of mind, we provide a seven(7) year guarantee on Ellemex. By deciding to apply Ellemex to your home, you will have added substantially to the value of your property as well as increasing it’s beauty and ‘street appeal’.